The applet purports to illustrate one of the many properties of an equilateral triangle. Area(AMB') + Area(BMC') + Area(CMA') = Area(A'MB) + Area(B'MC) + Area(C'MA). As in a sister problem, Draw AbAc||BC, BaBc||AC, and CaCb||AB. 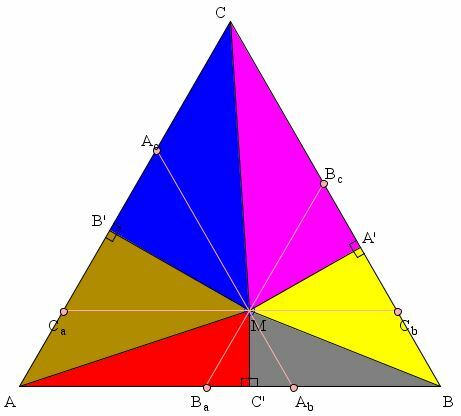 The three lines split ΔABC into three parallelograms and three smaller equilateral triangles. The three parallelograms are divided by the diagonals joining M to the vertices A, B, C into equal parts, whereas the three equilateral triangles are divided into equal parts by the lines joining M to the pedal points A', B', C'. So, for a proof, one only needs to rearrange the areas in (1).